At.7.30 am I catch the school mini bus and as I climb aboard the bus I instantly join in the habitual hum of weekend gossip and the routine discussion over who has managed to finish their homework. It’s Monday and after a couple of more stops on the route, we arrive at school just after 8.00 am to be met by the usual bustle of school backpacks, sport kits and book bags. I meet up with a couple of my class mates and we take the usual short cut through the main school house to Hunstanton, the home of St. Ed’s seniors. I hand my phone in at Registration and the day begins with a chat with my Tutor about what I achieved last week and which goals I am setting myself for the week ahead. She’s really pleased with my progress and I am awarded a green slip for good performance.... just a few more to go and I will win a Merit. Following Senior Assembly, it’s English; we’re all writing articles for the school newsletter at the moment. Next is a wander down to the DT Suite, one of my favourite lessons. We are currently creating our own metal sculptures using as many pieces of design equipment as we can think of and the DT suite is full of them so it is proving quite a task. Break time and it’s a quick sprint back to Hunstanton as our kitchen can get really busy. We get to make our own hot chocolate and toast and the school caterers always provide us with a big platter of fresh fruit too. There is a strict kitchen rota over who clears up after each break time and our form takers ensure that no negotiations take place over swapping responsibilities … there’s always a few who try though. Spanish and Art next on the timetable followed then by Games. We’ve been performing well in our matches so far this term, I think our hockey and netball teams are unbeaten. After lunch in the main dining room, it’s the usual sprint back to Hunstanton to either pick up from where we left off on the X-Box in the Seniors Common Room or to run around on the astro. 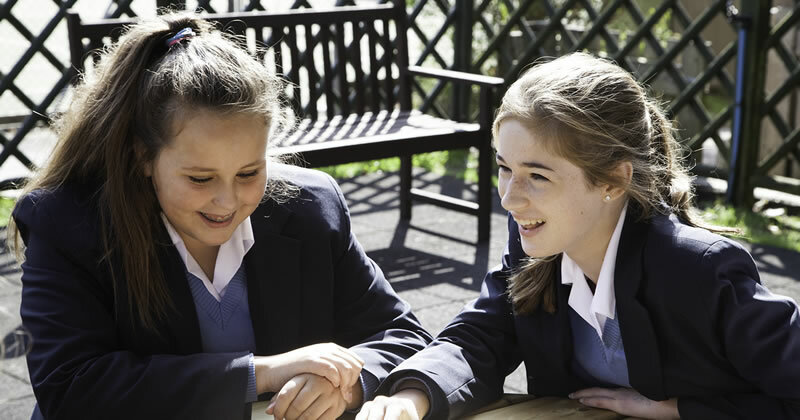 Some of us prefer to study and catch up on homework or others choose to get some fresh air out in our senior garden; the recent addition of an outside table tennis table has proved really popular. Maths followed by music this afternoon where some of us are writing our own songs and others are using the lesson time to practice Rock Band and rehearse their songs for the Community Concert later on this week. We are joining Form 2 in the Lower School this afternoon and helping them learn all about Road Safety as part of our community class and entrepreneurial certificate. Last week we spent time preparing props and games to use so we’re all looking forward to it. I think a few of us are walking into the village afterwards to spend break time in Grayshott’s Tea Room. Always worth a visit as they sell the best millionaire short bread ever! It’s Art Club after school today which I really enjoy as we are always out and about around the school grounds with are sketch books finding inspiration. Some of my class mates are off to their Scuba Diving skills class and both Science Club and Dance Club are taking place too. The day has gone really quickly. Before I know it, I’ll be back on the mini bus heading for home with the habitual hum of gossip starting again and tomorrow is yet another packed day as it’s match day and our Senior Boarding Night. Apparently according to my tutor, if the weather is good we are camping in the school grounds and cooking our own supper on a camp fire, now that will be fun.